Benromach distillery has continued its bottling of 1970s vintage single malts with a single cask expression distilled in 1977. The 39-year-old whisky from the Speyside distillery has been matured in a single refill American oak hogshead – cask number 1268, and bottled at 56% abv. Described as ‘smooth and sweet’ with notes of ‘ripe banana and passionfruit’, Benromach 1977 is presented in a decanter-style bottle inside a dark oak wooden box, and accompanied by a hardback book detailing the distillery’s history. David King, director at Benromach, said: ‘Almost four decades have passed since cask 1268 was laid down to quietly mature in the traditional dunnage warehouses that surround Benromach distillery. ‘While this beautiful whisky drew its incredible depth, character and luxurious flavours from the wood, all around the cask, the distillery was evolving and changing. After it closed in 1983, the distillery lay silent for more than 15 years before it was revived by the Urquhart family [owners of independent bottler Gordon & MacPhail]. 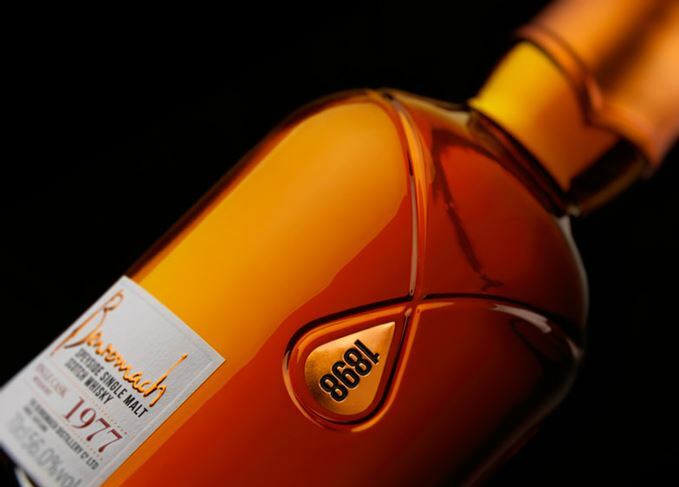 Just 225 bottles of Benromach 1977 have been released globally, at around €1,500 each. The Benromach 1977 expression follows the release of three vintage casks in 2016: 1973, 1974, and 1975. The distillery has added the limited edition expression to its stable of wine-influenced whiskies. The vintage builds on the Speyside distillery’s 20th anniversary malt releases. The 20-year-old single cask will celebrate 20 years since the distillery’s reopening. The Forres distillery has launched its second ever distillery exclusive. The cask strength eight-year-old limited release is Benromach’s first Sherry-matured peated malt.